Do you find yourself looking for things to do to break up the monotony of the ‘day in, day out’ routine? Look no further, Bookmans and the City of Phoenix Parks and Recreation has partnered up to keep you covered through December 7. It’s called Wednesday Wind Up and it’ll cheer you up right in time for hump day. Did we mention that it’s located at Civic Space park and is set directly around your lunch hour? You aren’t going to want to miss out on all of this fun! 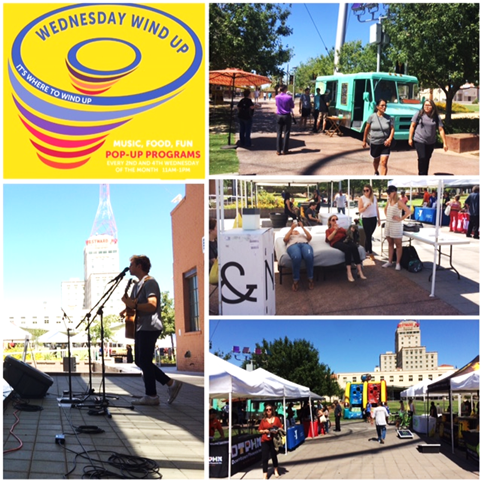 If you were wondering what kind of shenanigans you can find at these fabulous pop-up Wednesdays, keep on reading! Wednesday Wind Up’s are set at the perfect time for you to take a break from the daily grind. The event is every 2nd and 4th Thursday starting at 11:30am and ending at 1pm. Get ready for park games, activities, food trucks, super cool local vendors and a stage sponsored by none other than Bookmans Entertainment Exchange. This event has been going on since 2014 and Bookmans has been a sponsor and attendee from the beginning. It’s a completely free event that is family friendly, and takes place during some of the most beautiful months in Phoenix. Have your furry friend with you? Bring them along! There is something for everyone here at these mini festivals. If you’re interested in going there is no sign up sheet, just show up as you are and have some mid-week fun! Come visit us at the Bookmans booth to get all of the information you’ll need on upcoming events and our super rad passport deal we have going on. Get a stamp from us at a Wednesday Wind Upp and attend one of our Rad Reads events at the store to obtain another stamp. Once you’ve filled up your passport with the required stamps you can bring it into the Bookmans Phoenix location for a prize! You can always give any of our locations a call or go online for events information, but we hope to see you all this Wednesday!